Only a person living with a disability can truly understand how it impacts his or her own life. For those with serious limitations and barriers to employment, Social Security Disability (SSD) benefits may be their only way to live a life of dignity. 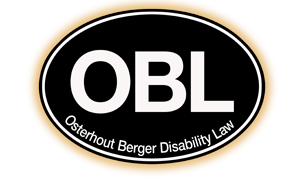 The attorneys at Osterhout Berger Disability Law assist disabled individuals with SSD benefits applications and appeals. Over the past 20 years, we have assisted more than 30,000 clients with virtually every type of disabling injury and condition. We have the skill to help you get the benefits you need. Free consultation: To discuss your condition and potential for securing SSD benefits, contact a us at 412-794-8003. Does Your Disability Qualify You for SSD Benefits? Disabilities come about in many shapes and forms. Some people are born with limitations. Others acquire various conditions and diseases throughout their lives. And, perhaps, most tragically, some permanent disabilities are the result of accidents. If you are the victim of a disabling condition, it is important to seek medical treatment. If you and your health care professionals believe your condition affects your ability to function day to day and work fulltime for more than 12 months, you may be eligible for Social Security Disability benefits. To discuss your disability or your Social Security Disability claim, please schedule a free confidential consultation by calling us at 412-794-8003 (locally in the Pittsburgh area) or toll free at 1-866-438-8773 (outside the Pittsburgh calling area). . If you prefer, you can fill out our intake form.